Hey everyone, this is Chris from StrategyBeam, and today we’re going to look at the art of repurposing content. This is an important subject because I know that you’re dealing with limited time and resources. You want to maximize your time and resources as efficiently as you can to drive more sales and more qualified leads to your site. So how do you do this? Let’s first look at that what’s the point of content in your company. What Is The Purpose Of Content For Your Business? The overarching purpose of your content should be an asset to your company. If your content is not driving leads and driving sales, then it’s a waste of time, money, and energy. So the purpose of content should in one way or another fulfill these needs for your company. Content should drive qualified leads. Lead generation is pretty essential. You know that getting people to your site who want to buy your products/services or buy from you is essential to the security of your business. Engage with your customers. This means you are talking with your customers on their level. Understanding what their needs are and getting to know them so that they feel trusted by you. Building awareness is another goal of content. If you’re a startup, then you need to get found online. Even if you’re a large company, you need to get seen when people think of a product or a service. Your audience needs to think of you, and the only way to do that is through content. Start a conversation with your ideal customers through content. People want to have a personal connection with brands. People don’t buy from companies because they buy from people they trust. Boosting sales is the basic goal of your content. This is pretty important, because if you don’t make money, then you’re not gonna stay in business for that long. Content should be able to fulfill these five needs in your company, and if it doesn’t, it’s a waste of time. So that makes sense, but why does repurposing matter? 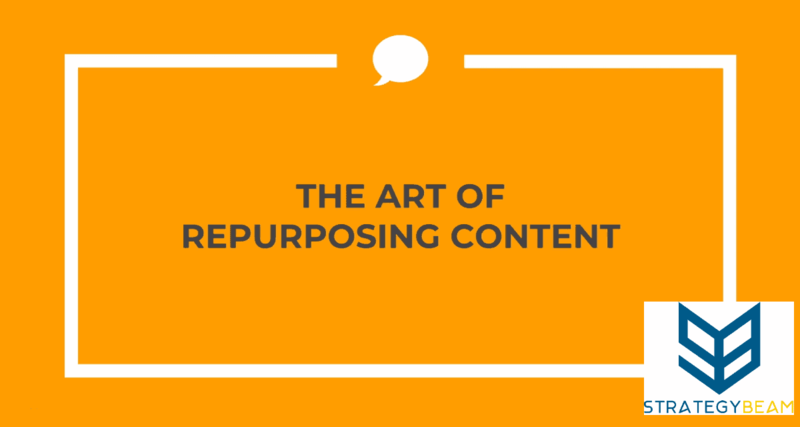 Why Does Repurposing Content Benefit Your Business? Repurposing content means that you improve the efficiency and the quality of your communication with your customers. This is because content cost time and money to create. It’s not just producing the content because this cost is seen in researching, manufacturing, optimizing, and publishing your content across multiple marketing channels. This includes things like Facebook, Instagram, Twitter, Linkedin, Pinterest, emails, and your website. Thinking about all that, it’s almost impossible to create high content unless you have a tremendous marketing team that just chugs out a bunch of content. For most businesses, it’s impossible to make content for each one of those channels, so this is where repurposing comes in. Consistency is a big reason to think about how to repurpose content for your business. If you’re just blogging once a month or you’re putting up on a Facebook post, every year people will forget about you, and the algorithms are going to forget about you too. So, consistency is a huge thing that you want, because you want to be everywhere at once when it comes to marketing. Repurposing content also allows you to focus on your business. If you want to keep your business open then you need to focus on your business sales. If you’re sitting there just making blog posts that aren’t going anywhere, instead of closing deals and making money, then you’re probably not going to be in business for too long. Repurposing content allows you to focus on what matters and that’s making money for your business and staying afloat. Let’s look at some quick ideas on repurposing content for your business. We just talked about the purpose of material and also why every purpose in content matters. Let’s look at some ideas for repurposing that your company can do. As an example, let’s look at this video that you are watching right now. I’m making this video with inexpensive tools, and it will be about 7 to 9 minutes maybe nine minutes long. Then I take the slideshows that I’m making right here and then I put them on a SlideShare. With the same blog post or a slightly modified one that I created from the original video transcription. Then I use quotes from the post in Tweets, and again that’s linking back to the blog posts that I have. You see that I am effectively using the same video content in two different spots, and the slides that I’m using for that video I’m using in SlideShare, and then from that video, I’m transcribing into a blog post. That blog post in one way or another is being used in about two or three different spots, so this is all coming from the same work that I’m doing. Repurposing content in this manner means that I do not have to repeat that work over and over again. This approach helps me focus on my business like looking at new ways to create results for my clients and other things like that. Here are some other ways that you can repurpose content and cross-pollinate the content that you’re creating for your business. How Can You Repurpose Content For Your Company? You could take a favorite blog post or blog posts and make an e-book. Each ebook should be about two to five pages, so you can take a blog post and just use something like Print Friendly or some other free program that allows you to repurpose content from a blog post into a PDF. Once that is done, you can merge that PDF and use this document as a lead generation strategy. You can link to posts in your emails, and this is a great way to grow your online influence since people sign up for your email lists are highly qualified. If you segment them correctly, then you could send them to a relevant post. This approach not only saves you time, but it could help with building a relationship between you and your audience. Plus repurposed content can get you some sales. You could turn videos into how-to slides. Much like what I’m doing here you create them into PDFs and then upload them into SlideShare or some other service like that that your customers are turning to access. Then also updating old blog posts you can use tools like Ahrefs or SEMrush to find out what your most popular blog posts are. Depending on what the needs of your company are at any given time, you can update those blog posts, so that’s always relevant for your audience. This also helps with internal linking structure and another SEO kind of tips and tricks for your company to rank. Since you already made those blog posts it’s good just to update them and then finally you can answer frequently asked questions with blog posts. If you have an FAQ page, you could just take each frequently asked question and then make a blog post for each one that’s about a thousand words long and optimize it to get found by Google. We’ve looked at what the purpose of content is, what’s the purpose of repurposing, how can you do it, and how to repurpose content for your business. How Do You Find Content To Repurpose For Your Company? First and foremost, any content that you repurpose needs to reinforce your sales cycle. I don’t mean that as in tricking people, I just mean that your content needs to be an asset for your company to drive sales. Think about your sales cycle, think about your target audience, think about your ideal customer, and then repurpose your content to showcase what your customers are looking for. Then think about what channels are relevant, and how you repurpose content will depend on not only who’s reading it but how they read it and how they consume that content. If you repurpose a blog post to a video that’s going to look a lot different than repurposing a blog post to a slideshow. Think about how you’re going to do it and who you’re doing it for. Then use tools to streamline the process. There’s a lot of free online marketing tools out there to help you with capturing a video or turning blog posts into PDFs so always use tools to streamline the process. The content needs to be an asset and help out your sales cycle. The entire goal of repurposing content is to reduce the time and stress that it takes you to grow your business in the context of what’s realistic for your company. Don’t try to go after 15 different channels if you can’t do it correctly. Start out with one or two channels and build from there as your company’s needs change. So there you have it guys. Thanks a lot for your time today for looking over content repurposing and how you can do it for your business. If you like the video, please give us a like and subscribe down below. Also, feel free to leave a comment about how your repurposing content and some tips and tricks that you would provide other small business owners. We look forward to talking with you on the next video and thanks a lot for your time on how to make more money online for your business.